From dumpsters to shipping containers, we've seen our share of tiny homes. And while we're intrigued by the actual structures, we're even more interested in the homeowners behind them. Meet Kathleen Morton and Greg Laudenslager. One month ago, the couple ditched their two-bedroom apartment in Denver and set out to reduce their environmental footprint by living in a 140-square-foot camper trailer (with a bathroom and kitchen) for the next year. Their goal? To build a new, slightly larger, but still tiny (270-square-foot) home nearby, and continue their greener lifestyle long term. Kathleen and Greg chatted with us about their move and how tiny living has been going for them so far. HuffPost Home: Tell us a little about how this project came about. Can you pinpoint a moment that sent this tiny living plan in motion? Greg: A culmination of things led to us deciding to live differently. We wanted a place with a yard, but didn't need an entire house. I lived in a minivan in New Zealand with my friend Scott in 2007, and it was easier than either of us could imagine. Kathleen and I thought that living tiny could free us up to spend more time together outdoors and that it was certainly worth trying! Kathleen: Greg has been talking about living small ever since we started dating. At first, I was like, yeah right! I thought sharing a two-bedroom apartment with Greg, our dog Blaize and my former roommate, Stacey, was small. But then it hit me: If we could make it work with four bodies in a two-bedroom apartment, living in a 140-square-foot camper trailer might not be too bad. We will be building a tiny house that will be around 270-square-feet, which will end up feeling very large! HuffPost Home: What things did you take into consideration when planning your move? Greg: As far as moving into the camper, my two biggest considerations that required planning was staying warm in the middle of winter and having the ability to shower (without having to rush or run out of water). Kathleen: We spent a good month talking about whether I could do it. Greg was pretty sure he could handle it, but I was nervous that I would get frustrated with our lifestyle changes. We agreed that we would try it out, and if it didn’t work out, we would go back to living in an apartment. When you know there’s a backup option, it really doesn’t seem so bad. HuffPost Home: Did you make any lifestyle changes beforehand? If so, what did that entail? Kathleen: For me, I had to downsize a lot! That meant several days and weeks of going through my clothes and evaluating what items I actually wore and how often I wore them. We had to stay at a family member’s place for a month while we worked on the camper trailer. Even though I appreciated having a place to stay, my commute to work increased and I didn’t feel settled. We ended up grabbing food on the go because we were constantly driving to work on the camper trailer or to meet up with friends in Denver. HuffPost Home: So what were you looking for exactly in terms of a "tiny" house? What did you find? And how did you find it? Greg: We are modifying our camper with insulation and added storage so we can comfortably live in it while we build our custom tiny house. Our experience living in the camper will inspire much of the design for our tiny home. As of now we envision building on a 20-foot trailer, lofting two separate bedrooms, and making the kitchen and bathroom the highlights! Kathleen: When we started talking about our tiny living options two months ago, a camper trailer seemed like a good starting place. We could live in it while we built a tiny house, and it would be a great resource for skiing and camping trips. We found a used 1969 camper trailer on Craigslist that was listed at a reasonable price. When I stepped inside, I thought, I could do this! This doesn’t seem too small. I also liked that it had a shower and storage space. It seemed too good to be true that it could sleep six people comfortably. HuffPost Home: You set out to give this tiny house living a try for a year, is it something you think you could continue doing beyond that? HuffPost Home: Tell us what your first few days have been like? What challenges and surprises have you encountered so far? Greg: So far so good! It has taken much longer to add insulation in some spots than I expected (primarily behind the shower and under the water cistern), but otherwise, it has gone as expected. The biggest surprise so far is noticing wasted space in houses I have been to many times before and never noticed. Using the composting toilet has been pleasantly normal and I am a bit surprised that there is no smell at all. It has been chilly at night and I am surprised Kathleen has let me keep the windows open! Kathleen: The most challenging part for me was waiting to move into the camper trailer while Greg worked on adding insulation. I just wanted to be there and experience it as soon as we bought it! Now that we’re living in it, camper trailer life isn’t all that bad. Because we are conscious of the water we use in the camper, I’ve been showering at a gym near work. That isn’t ideal, but hopefully it will inspire me to work out more. I am surprised to see and hear so much wildlife around me! I am in awe of how awesome the sunrises and sunsets look when you are able to see them on the horizon from your bedroom window. Freeing myself of all the clutter has let me really value the things I use on a daily basis. I believe the relationships we have with people are more important than the connections we have with our stuff. I am happy to have a reduced rent and the freedom to make our home wherever we’d like it to be! 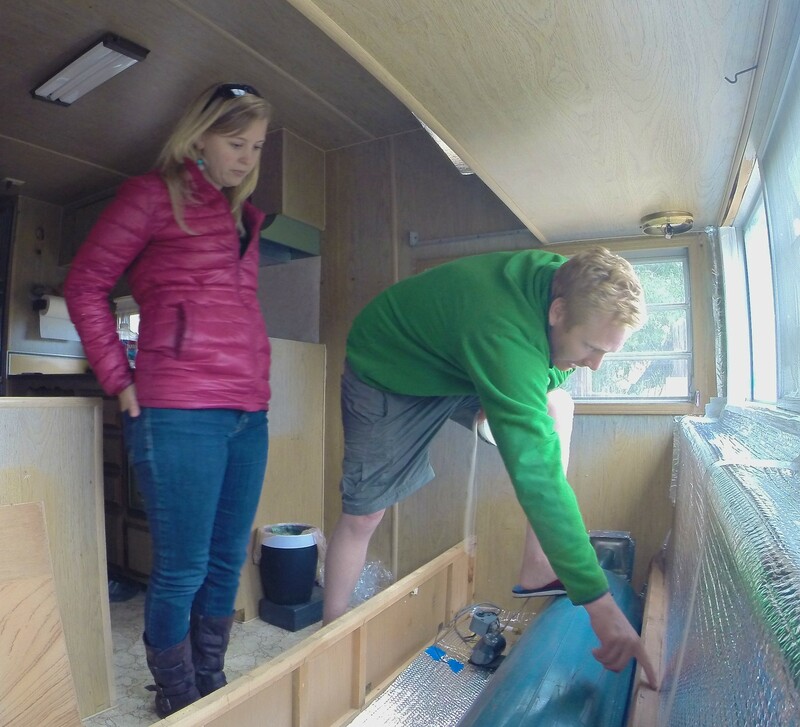 Follow Kathleen and Greg on their year-long journey at tinyhousetinyfootprint.com.